Donato Dozzy, who released his sought-after first album “K” this year, remains true to the tradition to team up with other producers. 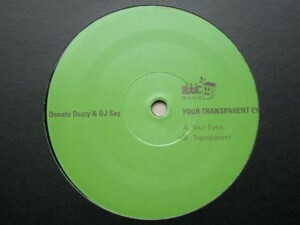 Two-track release on Attic Music is his second collaboration with DJ Say, after an EP on Mental Groove. It smells like dub techno but it is not. Mid-tempo “Your Eyes” opens the game with destructive bass and flashing synth effects. It stays very intense until a bit cheesy phrase something (?) in your eyes, surrounded by echoes, emerges from the background. Recurring sample adds hit potential but starts to annoy when the track progresses. Also a lower voice would have worked better. Even deeper “Transparent” pumps off with effects and bubbling sequences and can’t be distracted from its straightforward path. Something for the moments when you watch stars and dream about extraterrestrial beings. Two pretty decent cuts from Italians, without breaking into new territories.